Tele Vue has announced the newest DeLite focal lengths are now available. Rounding out the series are focal lengths of 13-mm, 4-mm, and 3-mm. These new DeLites are parfocal with the current 18.2- mm, 15-mm, 11-mm, 9-mm, 7-mm, and 5-mm models. 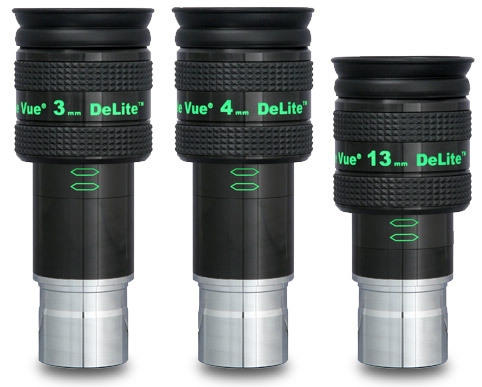 The DeLite 62-degree apparent field eyepieces were developed based on Tele Vue’s Ethos eyepiece design advancements, as were the Delos eyepieces, and offer a smaller, more economical and lightweight version of Delos. All models have 1.25-inch barrels, offer 20-mm eye-relief and are parfocal with Tele Vue’s 1.25-inch Plössl, Panoptic, Nagler, and Delos eyepieces. The DeLite is designed to handle the Tele Vue Dioptix astigmatism compensator. Each eyepiece is extremely lightweight, offers an ultra-slim profile and provides a unique sliding/locking eyeguard. The eyepiece line is named DeLite, because that is how Tele Vue describes the viewing experience. The name also recognizes Tele Vue designer Paul Dellechiaie’s work. Please visit www.televue.com website for more information.